how can the myth of the deserving rich be sustained? Mainly through a strategy of distortion by dilution. You almost never see apologists for inequality willing to talk about the 1 percent, let alone the really big winners. Instead, they talk about the top 20 percent, or at best the top 5 percent. What’s a sociologizer to do? Well, what you see, over and over, is that they find ways to avoid talking about the one percent. They talk about the top quintile, or at most the top 5 percent; this lets them discuss rising incomes at the top as if we were talking about two married lawyers or doctors, not the CEOs and private equity managers who are actually driving the numbers. And this in turn lets them keep the focus on comfortable topics like family structure, and away from uncomfortable topics like runaway finance and the corruption of our politics by great wealth. 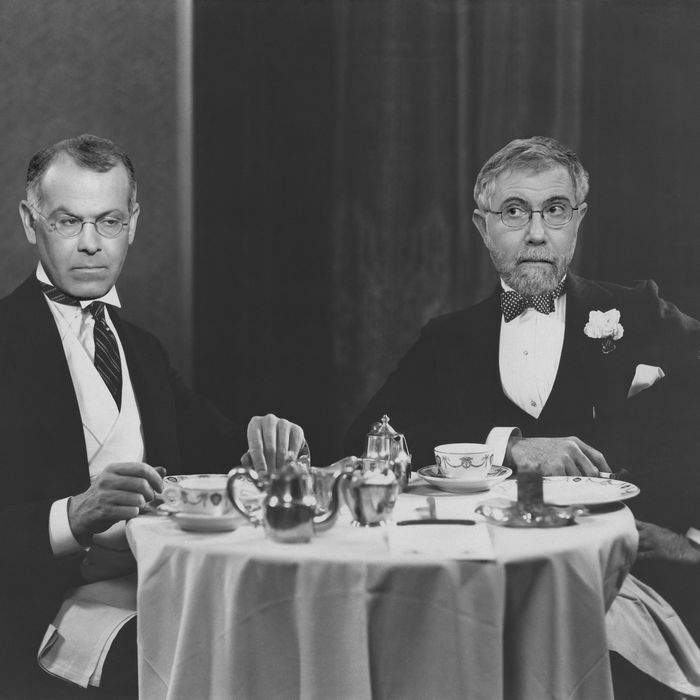 If only Krugman and Brooks knew about this direct disagreement of theirs, they could have some kind of debate.